Because this is a gluten free recipe, I must convey that my house is NOT gluten free, and so far I do not intend to make it that way. My motto is “everything in moderation” and until something happens which alters my way of thinking, my life will remain in balance. … and so I have chosen to do so here- on these pages and posts. I am sharing this basic waffle recipe, tweaked to be gluten free, because the morning I made them my daughter said, “Wow Mom these are great! Better than the waffles you normally make.” Honestly, the only thing I did was change the flour. I have always worked off the “Basic Waffles” recipe in The Joy of Cooking Cookbook on page 801, and have always altered the recipe by adding, omitting, and experimenting with other ingredients, but this was the first time I used a gluten free flour blend. These binding agents lend elasticity to baked goods. Good for gluten-free. But please note, a little goes a long way- use too much and the dish will be gummy, use too little and it will crumble too easily. This is the concept I have been experimenting with when altering a basic recipe with gluten-free flour. Choices on how much butter you use are factored by: 4 tablespoons for a reduced-fat waffle; 8 tablespoons for a classic light and fluffy waffle; or 16 tablespoons for the crunchiest most delicious waffle imaginable. Make a well in the center of the dry ingredients and pour in the wet ingredients. Gently whisk them together with a few strokes. If you wish, fold in other ingredients at this time. Otherwise, spoon approximately 1/2 cup batter (or the amount recommended by waffle manufacturer) onto the hot waffle iron, making sure its distributed evenly by using a non-meltable utensil. Close the lid and bake until waffle is golden brown. To gage when my waffles are done I use my own discretion, and utilize the “ready” light on my waffle maker as a reminder to check on them. So obviously serve immediately slathered with butter and syrup. Even add some powdered sugar to make a syrupy sugar paste. MMMMMM yummy. If you try this recipe, I welcome your feedback: to know if you thought these waffles were tasty, if you added your own alterations, or if there’s anything you might change for future quality purposes. Now I’m off to make some homemade almond milk and gluten-free snicker doodle cookies -with the almond pulp from my milk making……. 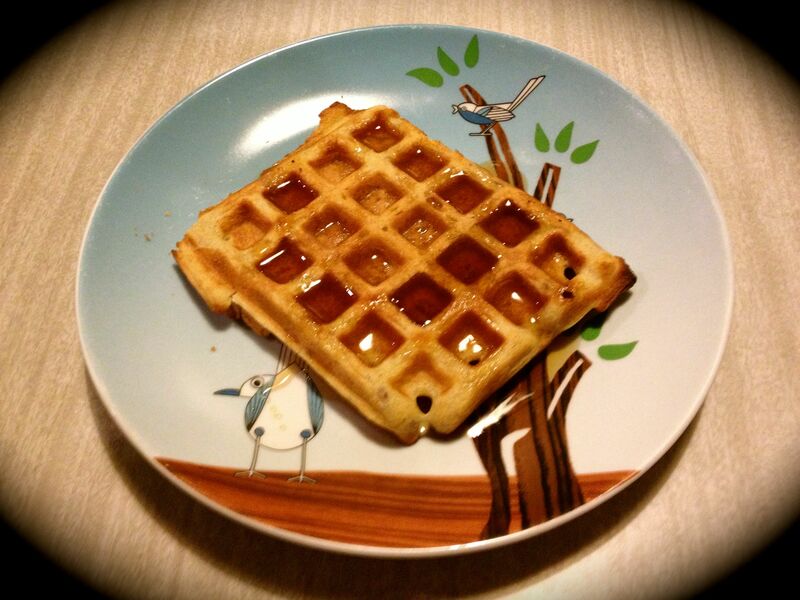 This entry was posted in gluten-free, morning energy, waffles and tagged breakfast, gluten-free, waffles. Bookmark the permalink.